White Wash Sand Dunes is an area South of Green River and West of Moab. The name is actually a bit misleading because this area is much more than sand dunes. The sand dune area(shaded on the map below) offers a great open play area with small dunes among the slickrock. It also has a number of good places to put a trailer and a fun wash to ride in. This is a great place for families because there is some riding near by for kids etc., and a few good trails within easy reach with multiple difficulty ratings. On this particular trip we actually did not ride in the dunes at all, but rather stayed in the wash and a couple of great trails designated for dirt bikes. The trails are marked in dark red on the map below. The northern one is part of the "Enduro Trail", the Southern trail is "Dead Cow Wash". 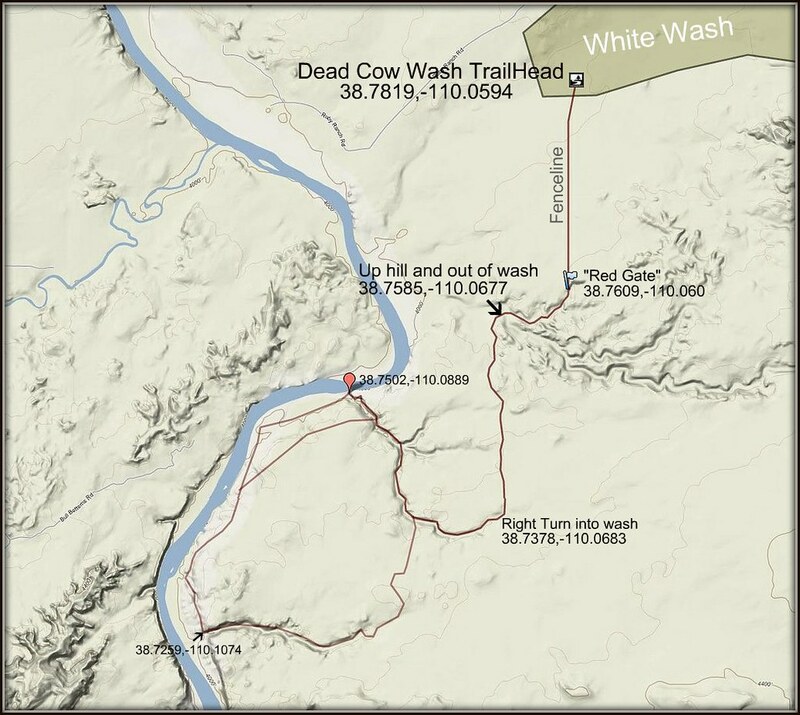 We were unable to complete the entire Dead Cow Wash loop, but the entire loop is mapped below. Click the icons on the map for more detail of each point. A mobile map can be accessed by clicking the icon to the right. We did have some cell service out there for our mobile map/gps device, but it was spotty. This video has footage from the areas marked in dark red on the map. The "Enduro section" I did alone, while the Dead Cow Wash trail was a family event. Below you can see what is referred to on the trail map as the "red gate"(designated by the flag on the map above, 38.760848,-110.06003). This is the real start of the Dead Cow Wash Loop Trail. It really is a spectacular trail. It has been referred to as "the luge" by friends that took us there because of the shape of the wash as it drops down to the river. It's always fun to reach the river and makes a nice spot to stop for a bit. More video footage and pictures can be found from my last trip down there. Here's a couple pics near camp. Not bad for the day after Thanksgiving!! The kids always have a blast playing in the sand. Alright...I know the Contour and GoPro are different cameras with different technologies...and maybe the new GoPro HD has some newer technologies - but this video makes all the rest look quite inferior. The contrast has been stepped up quite a bit and the color has a more vibrant rich tone to it...on top of all of that the depth of field is SUPERB - You really get a better feel watching the video for what is in front of you, whoops look like whoops and so forth and so on but that is probably because you are dealing with less of a distortion on the wider angle lens of the GoPro. Two thumbs up for me so far on the Contour! All that aside - I wish I was with you on this trip. It looked like a lot of fun. Lets figure out some winter rides for the boys (and us of course). I don't want my little guy getting too rusty on his skills by not riding. Yep, I love the cam so far..my only complaint is the wind noise, but I don't know if anyone really has that one nailed yet. I like the lens angle, but I think it might be a bit shakier..maybe. Wish ya'll could have joined us on this one, we'll definitely have to plan some winter rides. I need to get the boys some better cold weather gear sometime soon too. Looks like a fun place to ride a mountain bike! Yea, I think it could be.